Evergreen Cottage is situated in a private block, opposite the entrance to No. 5 Surf Beach. This charming 2 bedroom (1 queen bed and 1 double bunk with single on top) cottage is only minutes walk to the beach. The open plan living area provides space to enjoy time with friends and family, the laundry and toilet are located separately. For your comfort, a large air-conditioning split system is installed to suit all temperatures and the bathroom has a small bath suitable for young children located under the fresh rain water shower. Outside, there are large secure grassy playing areas for children. For entertaining, there are 2 decking areas, the back is a large deck with a gas BBQ and an outdoor dining table to seat 6 people suitable for all meals. 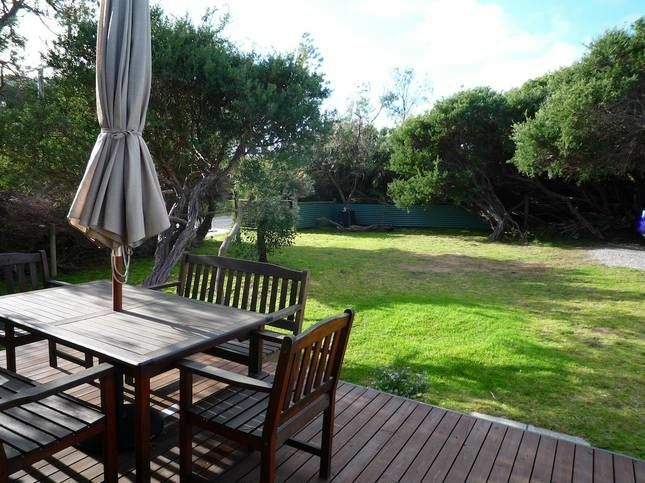 The front deck is located off the open plan living through the french doors, a great place to sit and watch the sunset. Bedding i.e. pillows, doona's and tea towels supplied. Please bring your own linen ie. towels, pillow cases, sheets, beach towels. Venus Bay Peninsula is a small coastal area located 165km from Melbourne. It is one of Victoria's best kept holiday secrets. The township is nestled into the sand dunes on a narrow peninsula of land bordered on one side by the ocean beaches of Bass Strait and on the other by the calm waters of Anderson Inlet. The golden sandy beaches stretch for 22km and include 5 magnificent surf beaches. Beach number 1 is patrolled by surf lifesavers during the summer months. The huge beaches are great for surfing, ocean fishing, swimming, walking, windsurfing, body surfing and beachcombing. Explore the rugged natural beauty of Venus Bay with a bushwalk in Cape Liptrap Coastal Park to spot the wildlife and admire the striking scenery. Visit Cape Liptrap Lighthouse or try some of the boating experiences. The Tarwin River flows into Venus Bay providing a tidal river, which is perfect for river and estuary fishing. Fishing platforms along the bank provide excellent access to the river for anglers. Alternatively, cycle the bike path from Venus Bay to Tarwin Lower or just stroll along the boardwalk that follows Tarwin River. Anderson's Inlet is the state's longest sand spit. Stroll along the 2km walking path, discover the rich bird life in the wetlands and mangroves or try fishing in the Inlet's sheltered waters. Venus Bay is also central to many natural attractions in the South Gippsland area, situated midway between Wilsons Promontory National Park and Philip Island. Venus Bay has a general store, several cafes/takeaway's, surf and fishing shop and a number of speciality shops.